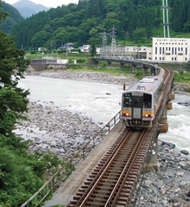 The Oito Line connects Itoigawa with the city of Matsumoto in Nagano Prefecture. It passes through a number of villages along the way as it winds through the mountains. As the line passes through the gorge, weaving back and forth across the Himekawa River, it almost seems to be stitching the mountains together, as if to mend the rift cut through the Alps by the swiftly flowing Himekawa. Although it was originally built this way out of necessity, the route it takes offers beautiful and unique views of the Himekawa Gorge, making it a popular scenic rail which offers access to a number of geosites. It is for this reason that it is also called "The Geopark Railroad." The difficulty in engineering this railroad is a result of the geology of the gorge itself. The geology of the area varies greatly in age, with Mesozoic and Paleozoic geology located to the west and Cenozoic geology to the east, within the Fossa Magna. The region is subject to a number of geological forces and has undergone many changes, which makes the strata here very brittle, impeding construction and making a number of safety measures important. 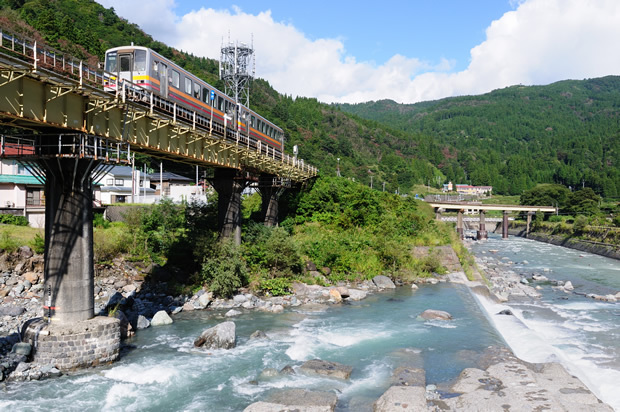 So the train passes through a number of tunnels and rock shelters and repeatedly crosses bridges back and forth across the Himekawa River, limiting the train's speed to a leisurely pace. The meandering path the train takes offers beautiful views of the gorge, but also serves the purpose of avoiding the more dangerous regions where erosion, landslides, and collapses are common. While the railroad may be antiquated by today's standards, when it was opened it was a marvel of civil engineering. For more information about the geology of the Himekawa Gorge, please check the Himekawa Gorge Geosite. Itoigawa Station is Itoigawa City's primary railroad station. Located in central Itoigawa, only a few hundred meters from the Sea of Japan, it services both local and express trains on the Hokuriku Main Line. This is also the station where the Oito Line begins. Both within and around the station, a number of jade specimens are on display, one of the few places in Japan where you will see such valuable stones displayed so publicly. In 2015, the Hokuriku Shinkansen will stop here, providing direct access to and from Tokyo. The next station down the Oito Line is Himekawa Station. An extremely small station, barely more than a platform, it was built in 1986 at the request of the local community, for whom it is an important stop. It was one of the last train stations built by Japanese National Railways before it was privatized and divided into the various JR companies which operate today. The station is located in front of Itoigawa Hot Springs, where water at near boiling temperatures wells up from 1300 meters below the surface through strata over 15 million years old. The area around Kubiki Ono Station is popular among photographers for its rustic scenery as the Oito Line passes through rice fields beneath the distant Northern Alps. The station is also located near the 'utou', an extremely well-preserved section of the ancient Salt Trail (a National Historic Monument) which once connected Itoigawa to Nagano Prefecture. The gently sloping forest trail offers visitors an opportunity to hike through history. Nechi Station is the only station along the Itoigawa section of the Oito Line which has a double track where trains bound in opposite directions pass each other. Fossa Magna Park, where an exposed section of Itoigawa-Shizuoka Tectonic Line can be seen, is a short 10 minute walk from this station. The park also features the largest example of pillow lava formations in Japan. This station is also popular as a starting point for people planning to climb beautiful Mt. Amakazariyama or enjoy winter sports at Itoigawa Seaside Valley Ski Resort. Jade was first discovered in Japan in 1938 upstream along the Kotakigawa River, which flows into the Himekawa hear near Kotaki Station. The Kotakigawa Jade Gorge is now a nationally protected natural monument. The Kotakigawa Jade Gorge is the main attraction of the Kotakigawa Jade Gorge Geosite, which also features an observation deck for viewing majestic Mt. Myojo and many leisure facilities at nearby Takanami-no-ike Pond. This geosite can be said to be the one which most represents the Itoigawa Global Geopark. For those interested in hiking, it is 5km (about one hour) to the jade gorge by foot. Please be mindful and keep clear of wild animals, particularly bears and monkeys, which inhabit the mountain forests. Hiraiwa Station is the closest station to the border with Nagano Prefecture. A section of the track even briefly passes through Nagano between here and Kotaki Station. In summer, this station fills with hikers looking to climb the Northern Alps. A shuttle bus runs between here and Renge Onsen Hot Springs Lodge, which is a popular basecamp. Nearby the station are a number of hot spring hotels, where you can enjoy the beauty of the Himekawa Gorge while relaxing in a hot bath. The Oito Line between Itoigawa Station and Minami Otari Station (located just across the border in Otari Village, Nagano Prefecture) is not electrified, and so diesel trains are used. Until recently, the model of train used here was the Kiha-52. The Oito Line was one of the few lines in Japan which operated this model of train, which had a modeling and color scheme which was very typical of trains built in the 1960s. Due to their age and retro appearance, the trains had a number of fans. Unfortunately, in 2010 they were replaced by JR with newer trains. The currently under construction Hokuriku Shinkansen Itoigawa Station South Entrance is planned to include a preserved Kiha-52 which visitors will be able to tour.